Qatar: Wind of Change or a Minor Facelift? After the Cabinet reshuffling at the beginning of this year, when many prominent representatives of the Al-Attiyah clan, the second most powerful after the House of Thani, were replaced with members of the ruling dynasty, some experts in the West and Russia jumped to the conclusion that the “Gas Emirate’s” policy would be changing as well. It is a known fact that Syrian militants “patronized” certain representatives of the Qatar leadership, including Foreign Minister Khalid Al-Attiyah (he was “supervising” militants from Islamic State and Jabhat al-Nusra). A terrorist war on the Sinai Peninsula against the leadership of the Arab Republic of Egypt (ARE) and Egyptian Army was also financed by Qatar. The Al-Attiyah clan is not only influential, but also rich. Its head Abdullah Al-Attiyah masterminded the Qatar NLG empire. He also held the position of Deputy Prime Minister and the Minister of Energy of the country for a lengthy period of time, and later was appointed Head of the Emir’s court and played the role of the chief anti-corruption crusader. He gave countenance to Sheikha Mozah, the wife of the former and the mother of the current emirs and patronized the American giant ExxonMobil—a key stakeholder on the country’s energy market. And only with the arrival of Russian aerospace forces to Syria in October 2015, the influence of this clan began shrinking since the many-billion “investment” in the overthrowing of Bashar al- Assad’s regime (which was largely advocated by the Al-Attiyahs) did not bring expected “dividends.” Qatar’s dreams of running a gas pipeline to Turkey across the territory of the Syrian Arab Republic (SAR), as well as its hopes that Doha and Ankara would directly influencing the EU’s energy security (another Abdullah Al-Attiyah’s ambitious plan) went up in smoke. Today Qatar has to either “outsource” ISIS militants to Libya to fight in the civil war against the pro-Egypt groups, or to Yemen where it is fighting against the Houthis (Ansar Allah) alongside Saudi Arabia. In August-September of last year it seemed that Doha along with other architects of the Arab Spring, is about to complete the process of division of the spheres of influence in the Arab world. Interference of Russian aerospace forces, however, has basically put an end to further development of the long-term “Colored Revolutions” project launched at the beginning of 2011. Young Sheikh Tamin, Qatar’s Emir, who is too young and sick (he has diabetes) had no other choice in this situation, but to give a minor facelift to his Cabinet. What is noteworthy is that it happened right after his official visit to Moscow (on January 17-19 of this year) where he had talks with Russian President Vladimir Putin. Head of the Foreign Ministry Khalid Al-Attiyah was appointed Defense Minister of Qatar. This appointment can be construed as an honorable resignation. In Qatar, the Ministry of Defense is much less important than the Foreign Ministry. Especially since his Highness Emir himself occupies the position of the Foreign Minister, while the key military officer serves as Chief of Staff. Besides, Khalid was replaced with a member of the ruling Al Thani dynasty. Before, another member of the Al-Attiyah clan, Hamad Bin Ali Al-Attiyah, simultaneously held two positions of Defense Minister of the state and Chief of Staff. After his dismissal, Hamad Bin Ali Al-Attiyah focused on the development of cooperation of his “family” businesses with western partners. It should be noted that his dismissal was authorized by Emir himself, who decided to take control of the defense affairs as well. This novelty gave rise to rumors that the ruler of Qatar is changing the “gatekeepers” mediating contracts with western companies. This “standard business procedure” typical of all Arab monarchies allows one person to supervise all contracts, while protecting the member of the royal family from possible complications. During the reign of Saudi Arabian King Adbullah, the Lebanese brothers Fustok played the role of the “gatekeepers.” With accession of King Salman, they were dismissed, and French businessmen were affected the most. Today Emir of Qatar has a firm grip of the portfolio of core defense contracts because Qatar is planning to overhaul its armed forces and reinforce cooperation with Turkey in the field of defense. Sheikh Tamin’s funds and companies will be supervising the construction of a Turkish military base in Qatar. As for the possible changes in the Qatar’s foreign policy in the wake of the recent swaps in the Cabinet, it seems that while the general line of policy might be adjusted to respond to new challenges, it would never be changed in a radical way. What is more, the latest rearrangements of the Cabinet did not affect the balance of powers in Qatar. The Al-Attiyah clan continues to remain the key ally of the ruling House of Al Thani, though it is not as influential as it used to be. Since Hamad bin Ali Al-Attiyah was appointed the Emir’s Military Adviser, his reputation in the eyes of foreign businessmen should not suffer. Western countries regard the Al-Attiyah clan as their principal lobbyist in Doha. As for his own company Al-Attiyah Group of Trading Companies founded in 1992, it continues its expansion and not only in the raw material sector of economy. Today this company is negotiating contracts with European and Canadian companies through its subsidiaries European Trading Company and Prodev (Canada). One of Hamad bin Ali Al-Attiyah’s companies has established a joint venture with the British private security company G4s. Mr. Al-Attiyah cooperates with Vodafone and InterContinental. A subsidiary of the Al-Attiyah Group of Trading Companies Dax Express is already engaged in the shipment of freight from Al Udeid Air Base, the largest Pentagon’s military center in the Middle East, to the US. Mr. Al-Attiyah used to own businesses associated with the defense sector, but they were inherited by his relative along with the numerous contacts he had established in this field. He participated in the negotiation of purchase of 24 Rafal fighters from French Dassault Aviation in May 2015. In July 2014 he signed a contract with the then Secretary of Defense Chuck Hagel on the procurements of Patriot Missile Defense Systems, anti-tank missiles and Apache helicopters. Most probably, dismissal of Hamad bin Ali Al-Attiyah was just part of the new Emir’s policy on replacement of his father’s close partners with younger, energetic people. 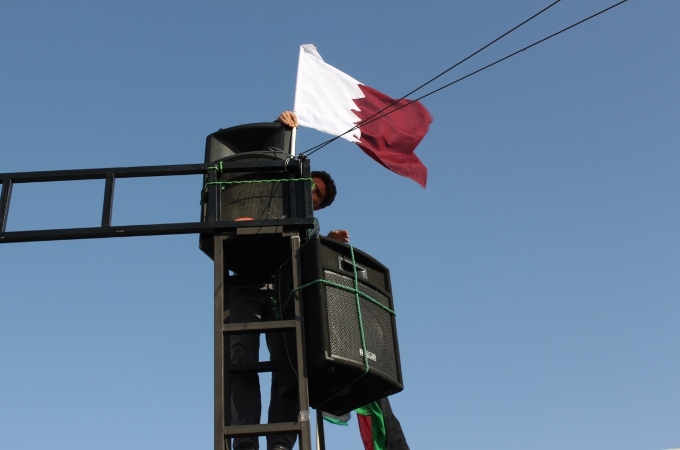 The balance of powers typical of Qatar however was not compromised. The ranking of the Al-Attiyah clan in the oil and gas sector as well as in the defense sector has not changed either, which means that it would be premature to construe the recent changes in the Qatar’s leadership as a sign of some radical policy shift. What is much more important, though, is that Doha’s hopes to implement a strategically important for its foreign policy and economy project on construction of a Qatar-Turkey gas pipeline running across Syria will remain a pie in the sky. It is precisely because of these “aspirations” the situation in Syria has emerged not as a regional but as a global problem, including in the domain of oil and natural gas transportation. If a pipeline is laid through the Syrian territory, Qatar would gain the most benefit, as it would receive access to the European market of raw materials. In this case, Qatar would challenge the suppliers of Russian natural gas. It is not a secret that Moscow and Doha hold completely different views of the Syrian crisis. While Qatar would be happy to see Bashar al-Assad toppled, Russia is combating terrorists at a formal request of the legitimate Syrian president, which gives Doha stomach cramps. That means that despite Doha’s energetic attempts to establish a dialogue with Moscow, there will be no progress because the Emirate and Russia’s have opposing views of the Syrian conflict. The situation is further complicated because Qatar in its struggle against the ruling Syrian regime, supported by its closest ally Turkey, continues to transfer jihadists to Syria through the Turkish territory with the consent of the latter. If to look at the situation at this angle, Qatar poses a much more serious threat to Russia than just a tougher competition on the energy market. Qatar has been a serious competitor of Russia in the domain of natural gas for quite some time. Clearly, the situation will remain the same in the near future. That explains why Russia ranks low on the list of Qatar’s business partners despite Doha’s alluring promises of investments and cooperation in the area of defense. That also explains why any Doha’s attempts to establish a constructive dialogue with Moscow would prove inviable. The only somewhat sensible reason to continue would be to master the art of diplomacy or to demonstrate good will without a slightest chance to find common grounds. And the situation would not change unless Qatar abandons its aggressive policy in the region contradicting Russia’s interests in the Middle East.